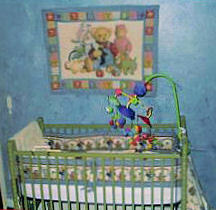 Baby boy's teddy bear nursery theme with blue jean denim blue wall painting technique. Our son's blue jean and teddy bear nursery came about after finding a bedding set that my husband and I both fell in love with. When we learned that we would finally be decorating a nursery for a baby boy I started to prepare for the long awaited event. I bought paint in two shades of blue and used a Woolie painting technique that and blended them together to achieve a faded denim look that really does look like a pair of old blue jeans. sets in many different colors including this one in denim blue and chocolate brown. After the walls were done, I trimmed the baseboard and molding using the lighter color blue. Next, I shopped for a paint color that we could use for the crib so that it would match the baby bedding but not melt and disappear into the wall color. I could not find a green to match, so I took my blanket in to a hardware store where they did a color match on a machine. The store clerks had their doubts, but when it was mixed it matched perfectly! I cried tears of joy right there in the store much to the embarrassment of my teenager. I cried again a year later when I took the crib down and my son had refused to sleep in it. He was terrified of the crib for some reason and had to make other sleeping arrangements. The next step is Godzilla or Spiderman bedding. The good thing is that both of them should go well with the denim blue nursery walls that we did for the blue jean and teddy bear nursery. I hope that the moms and dads that visit Unique Baby Gear Ideas have enjoyed reading about our son's room as much as we enjoyed decorating it. Anything you could advise would e appreciated. Now forgive me, because I'm not really a fan of cheesy themes. This room is just really depressing. I don't blame your son one bit. Besides the effort painting, it looks like all you did was go shopping at toys r us. Shouldn't a baby room be happier? Very nicely matched up though. I had the same nursery pattern for the quilt ect. The room is great, all of your planning and love has gone into it. I had fun! I love the jean denim theme. i like that the blue matches the later 'big boy' themes, too. I love your nursery design. Hope you win. I love this. Wish we had a little grand baby to put in there! it's great, love the paint. I love the blue teddy bear design! I love what you did with the walls. Very nice. Not everyone can do a faux finish well - but this looks great! Cute cute! This is a wonderful design. Join in and write your own page! It's easy to do. How? Simply click here to return to TEDDY BEAR THEME NURSERY PICTURES and DECORATING IDEAS.